Discussion in 'Making Money' started by Sherb, Feb 24, 2016. 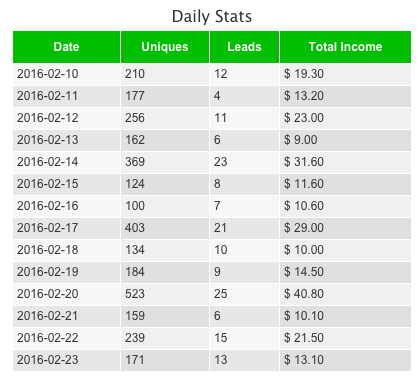 Here is exactly how I've been making $10 to $40 per day on autopilot (Screen Shot). Total time, about an hour a week: 30 minutes once per week, five minutes for the remaining six days of the week. Maybe three to four hours setup time at the start. The only program you will need is Google Chrome. Good for some fun money while I work on my case study. DISCLAIMER: This is NSFW and consists of utilizing an adult affiliate network, Twitter, and not work safe images to promote your account. DISCLAIMER 2: Yes, that was me who posted this on /r/beermoney. Sign up for CrakRevenue. The application is straightforward and simple. Under Website, just put that you are promoting via Twitter. Wait for an acceptance email. Think of some adult niche that you think you can find a bunch of images for. Want to know what I did? This is sketchy mind you. I found a real pornstar who had a Twitter that didn't have that many followers (sitting at 18k). She was using some weird username, and her real name wasn't taken. So I took it. Now I've got way more followers than she does. Download 200 images in your niche. More is better, but 200 works just fine. Sign up for Hootsuite (http://www.hootsuite.com). It's free for I think three social networks. Everything you're doing here is free. Once you are all set, hit the Add Social Network button, and connect your Twitter. Now go to Settings > AutoSchedule. Schedule up to five messages per day between 5am and 10pm. Schedule them to happen seven days per week. Go back to your Dashboard. At the top bar, you should see a box that says "Compose Message". When you click, it will drop down a box with buttons and such. Pin your Twitter account so it automatically is chosen. Then click the button that looks like a calendar and turn AutoSchedule on. What you have done at this point is set up a fully-functioning Twitter automation machine that will post automatically whenever you'd like. Go to your CrakRevenue dashboard. Now go to Web Offers (http://www.crakrevenue.com/web_offers). I suggest the My Free Cams (http://www.crakrevenue.com/web_offers?product_id=257) offer. $4 Pay Per Lead. But I like to mix and match. Under Choose Creative, there will be Banner chosen. Change that to Link. Insert a random tracker name. Apply your changes. See that link that comes up at the bottom? That's your pot of gold. Copy that link, and paste it into http://Goo.gl/ to shorten and mask it. Leave that tab open. Back in Hootsuite, we are going to schedule out some messages. Type something into your compose message box. Include the link. Upload one of your 200+ images with the attach button. Make sure it is all within the constraints of the 140 character limit. Example: "I joined My Free Cams, new show starting in an hour! Join me! http://goo.gl/xxxxxx" And the image. Boom. Repeat this process until you get to the point where you want to tear your eyes out. Try to get all 200 scheduled. Only put your link in every three to five scheduled messages. You don't want to get pegged as a spammer immediately. If you are doing five Tweets a day, and you manage to schedule all 200 of your images with a Tweet for each one, you're golden for 40 days. If you want to cut it down to two Tweets a day, and you follow the same scheme, then you're set for 100 days. It's all personal preference. The AutoSchedule sets it up for random times in that 5am to 10pm timeframe. You're probably thinking: That's great, I have a nice automated system, but I have no followers. Let's fix that, with minimal effort expended on your part. I'm using Chrome for this process. I suggest you do the same. Go to your Twitter. Pimp it out if you haven't done so. Put your shortened link down as the website. Add a profile and header image. The works. These above steps are now complete. You won't need to revisit this unless you a) run out of scheduled messages and need to refresh, or b) want to change up the CrakRevenue offers. The following steps are to be performed daily. Within a few days, you will get it to where your actual hands-on work is five minutes or less. and hit enter. What this will start to do is automatically follow unfollowed Twitter accounts in the scrolled list of accounts, and stops you when you hit your following limit. Once you hit the limit, you can't follow any more for 24 hours. I can't recall if it's lower at first, but on my current account I can follow between 800 and 900 per day. Repeat this process 24 hours later, after liking any responses to your images. That's it! Follow back rates are generally between a drastic low of 15% and a high of 40%. Meaning if you can follow 800 accounts per day, you can see between 120 and 320 followers per day as a result. After a while, people will start to follow you on their own. I'm sure you can see where traffic to your link will increase as you progress. If you average 200 followers gained per 24 hour period, by the time your AutoSchedule dries up 40 days later, you should be looking at 8,000 followers or more. Idea 1: Research Bulk CSV Importing in Hootsuite to figure out how you can schedule up to 350 messages at once. I use this on some other Twitter accounts, but have yet to do so with my CrakRevenue one. Idea 2: Register a website relating to your Twitter account. Build it up, and put banners and links to your CrakRevenue offers. Occasionally point your followers to the site. Change your Website in the Twitter profile to your new site. Enjoy your additional traffic method. to unfollow everyone who doesn't follow you back. Idea 4: Promote other affiliate networks. Once I am using with relatively good success is Tittygram. Order a Tittygram for around $12 with your link or Twitter handle on it, and then promote your own referral link with your attached image. Or you can use some of the social media programs and tools available here. I was simply trying to make it as minimalist and simple as possible for those who don't want to deal with the learning curve or initial investment of a program. The possibilities are endless. This is just scratching the surface and getting the revenue starting to flow in with minimal effort. Hope you enjoyed it. EDIT: Please don't PM me about this method. I am simply sharing some knowledge and a tactic that has worked well for me. Sounds good and something I'll do for beer money. awesome guide i will try it right now good luck for your goal mate! How many days did it take for you to get your first sale from this method? Good TUT. I was doing something similar but with different tools. Easy money when you get a decent following. Instead of Hootsuite you can automate the posting with IFTTT too, you just need something what triggers your IFTTT recipe, which for example can be an email to Gmail, so you don't have to make hundreds of schedules and re-schedule it every time with Hootsuite, it's enough if you make 5 Gmail to Twitter recipes total with IFTTT (if you want to post 5 times per day) and those will be triggered every day until you don't say stop, plus you can easily edit the recipes, if you want to switch urls or anything. 4) IFTTT Gmail to Twitter recipes, the required amount of these equals to the desired tweets per day. 5) The Boomerang Gmail addon for recurring scheduled email sending with Gmail, with this you can control the amount of emails and the date/time of sending, these incoming emails will trigger the IFTTT Gmail to Twitter recipe, so by scheduling these Boomerang emails with Gmail, practically you're controlling how many tweets you want to send and when. Btw this Boomerang addon is a clever little thing in itself and it can be used for other purposes as well. This way the tweeting process becomes truly autopilot, you set it once and you can forget it, i set up a few Twitter and Tumblr accs like this, they don't do anything else just post and they're gaining organic followers from the Twitter/Tumblr search (get your hashtags right! ), you can build a whole autopilot social media empire, if you wish. But i guess we don't want to post the same 5 tweets over and over again, in that case more recipes can be made, which can be easily automated with iMacros for instance. If image tweets, the images can be uploaded to imgur, you'll need the direct links for the IFTTT recipes. I don't really want to expand on this and hi-jacking the thread even more, it's just another method to autopost on social media for completely free. Maybe it's a little bit confusing at first hearing, but once you're there, it's pretty self-explanatory. If anyone decides to go down this route, i'm pretty sure, it won't be too hard to execute. Nice followback ratio you have there, with the accs i'm using in a bot, i'm glad if i can get 15% - labeled "drastically low" by you lol - and i follow targeted people. I love beer, thanks for this share. I hope i wont grow a beer stomach and if i do, it will be ur fault . Thanks... we surely need more of this kind of posts. That's another great method Sherb, i'm going to try it. I would suggest making a Twitter to Tumblr recipe on ifttt, this way you can grow your tumblr which is a great source for adult traffic. I'm sure that you can increase your earnings that way. throw Instagram and your own website In there with juicy ads and you can increase revenue. NINJA Webhosting. Shared, VPS & Dedicated Hosting Solutions. Looks like a nice method. Thanks for sharing. Don't feel dizzy... Take it one step at a time..
12. Go back to Hootsuite. Now copy one message and include your CrakRevenue shortened affiliate link at the end of the message. Upload one of your 200 images that you downloaded in the beginning. 13. Once you have your message + affiliate link + image ...now you autoschedule it. Keep in mind you have to send out 5 msgs in a day between 5 am and 10 pm. If you autoschedule the first message for 5 am, spread out the rest of the 4 msgs throughout the day until 10 pm. 14. Do the autoscheduling for 7 days - all 35 msgs. 11.Now you have only worked on one week's worth of messages. You have 200 images. You used 35 images (you have 165 left). 12.Repeat the process until you have created the remaining 165 messages for the 165 images. Finally - at each step - go back and read the OP's post to understand HOW it is done, including how to grow Twitter followers. PS: OP (or anyone else) please correct me if I got it wrong. I myself am going to implement this from tomorrow and this helps me understand the process better. And don't forget to run the console in Google chrome to get twitter followers. do it in the morning before you brush you teeth, and then come back and add the other code.